Marcel Monnier : Surf Riding at Hilo, 1885. 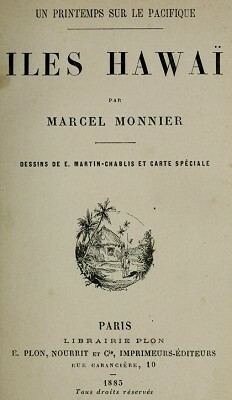 E. Plon, Nourrit et Cie, Paris, 1885. Noted by Hervé Manificat article in The Surfer's Journal (French edition) 2012? Hilo is the capital of Hawaii, the home of a governor and a sheriff. hamlet in the jungle, at the meeting point of two paths, one rising from the sea to the forest, the other winding along the coast. There should not seek avenues tarmac, the residencies sumptuous, the movement, the sound of Honolulu; never vehicle has rolled in two streets just leveled, lined with hedges invasive nents, we can move the island on horseback or litter. Foreigners, few still remain largely in their plantations several miles from the village, so the houses worthy of the name they are very rare. children of the country, are content with little, live daily happy, carefree, like fish sound in water. The comparison is even more just as it applies to an amphibious people; all these people going to a good half bath their existence, they swim and dive without have never learned, instinctively, from the age most tender their favorite game is to sport foot waterfalls, or to receive the shock of the blade. The Wailuku River after a course of more turbulent passes a final level and pre-dashes into the ocean at the bottom of a deep cove. On all sides the rocks overlooking, and the both sides, large trees laden with plants parasites bow on the abyss from which rises a fresh breath during the hottest hours of the day. There, from morning to evening, children, youth and girls, take their antics. A narrow platform form which can be accessed by crawling on rugo- universities of the wet wall, is the appointment of intrepid divers. They settled there with provisions for the day, calabashes poï and flowers. They rest there between two swimming. At times we see rise in number five or six, decked with garlands, their long fluttering on the colorful shirt, haiand to be placed in one row at the edge of the preprecipice. Similarly, laughing, blinded, crown through falling on the shoulders, calling their companions who were sitting thirty feet higher on the grassy terrace, chest forward, legs dangling, watching. Men are fond of another exercise which requires uncommon strength and flexibility. sports, they enter the sea at the time of surf, driving before them their piece of wood to a distance of half a mile, then beginning to swim, they lie flat on the board and suddenly, as if moved by a spring,stand up, arms extended, balanced, sometimes removed on the waves, sometimes slipperying in the palm of the blade. The flood them back to the beach at the speed of a galloping horse. board that supports disappears beneath the foam, and it is a strange sight to see these men supported on the water by an invisible power. des cascades, ou à recevoir le choc de la lame. cipite dans l'Océan, au fond d'une anse profonde. souffle frais aux heures les plus chaudes du jour. de sport, ils entrent dans la mer au moment du ressac, poussant devant eux leur pièce de bois jusqu'à une distance d'un demi-mille; puis, cessant de nager, ils s'allongent à plat ventre sur la planche et, soudain, comme mus par un ressort, se dressent debout, les bras étendus, en équilibre, tantôt enlevés sur la crête des vagues, tantôt glissant dans le creux de la lame. Le flot les ramène vers la plage à la vitesse d'un cheval au galop. Ils n'ont pour tout vêtement que le malo, lam- beau d'étoffe noué autour des reins; leurs chairs ruisselantes prennent au soleil des reflets d'or, la planche qui les supporte disparaît sous l'écume, et c'est un spectacle étrange que celui de ces hommes soutenus sur les eaux par une puissance invisible. Geoff Cater (2013) : Marcel Monnier : Surf Riding at Hilo, 1885.